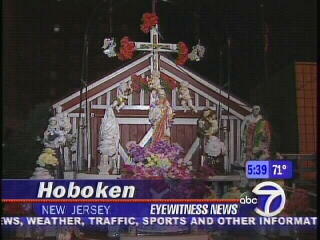 Julio Dones' Catholic shrine has fronted a housing project in Hoboken for three decades, its statues of saints and crucifixes viewed as a positive diversion from area drug deals. But these past two days, word that the shrine's Sacred Heart of Jesus statue spontaneously blinked its right eye twice and kept it open -- while its left eye stayed closed -- sparked more excitement there than ever. Both of the statue's eyes are normally closed, Dones said. Dones, a 52-year-old neighborhood preacher who attends the nearby St. Francis Roman Catholic Church and maintains the shrine year-round, said he first saw the blinking after a friend alerted him to it Thursday, around 2 p.m. He said tears flowed from the eye, and that Jesus' head turned to the right. "I felt a chill going up my body, the Holy Spirit coming upon me," he said. "I ... told the people to come see the great sight that just occurred. See, people don't understand what God does. God does things in mysterious ways." Dones, who found the statue in the trash in Jersey City a year ago, said a woman who stopped by yesterday saw the right eye blink and began crying. Yesterday afternoon, not everyone who stopped by said they believed. Some were amazed at the similarities in the Jesus statue's eyes and Dones' eyes. Dones is blind in his left eye, and his eyelid droops. I'm sorry, but once again, as with the case of Underpass Virgin and Window Virgin, I just don't see what the faithful claim to see. My faith must not be strong enough, I guess. 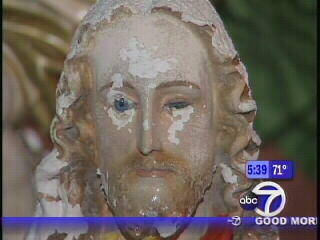 What I do see is an old, beat-up statue of Jesus with one of the eyelids broken off, leaving the eye exposed. Whether it was always that way or whether someone damaged it, who knows? Indeed, the fact that the open right eye now makes the statue look like Dones has to make you wonder about kids pulling a prank. But a bona fide vision? I don't think so. I'm also not sure how to classify this particularly religious vision. I don't think it is pareidolia, because pareidolia is seeing an object in a vague pattern or form, like seeing the Virgin Mary on an expressway underpass stain or seeing a vision of Lenin in a shower. Perhaps a little research will lead me to a specific term to describe this sort of wishful thinking vision. My big problem is, why didn't the miracle include the Jesus statue's eyes turning brown like they should be logically if it was supposed to be Jesus? And is this Jesus a blonde, too? Show some respect for our squinty eye savior! When people want to believe, they will see what confirms their belief, weeping or winking statues, images in windex, etc. Personally I think those who think parlour tricks are signs from their creator have very weak faith. now i'll never get to sleep tonight. Tim: Exactly. Is this the best an all-powerful supernatural deity can do? ROTFL. It's not even a particularly well-painted fake eye. This reminds me of Gunter Grass's Tin Drum. Anyone read that one? In one scene the hero puts is drumsticks in the hands of a statue of jesus and challenges it to drum. It doesn't, so the boy loses his faith. I have my own theory. I live in Hoboken and went to see the miracle and interviewed Julio. He did tell me the report of the head turning are not acurate. I have many ideas about this miracle or phenomene. maybe this is only a miracle to get the people close to religion and to Jesus. maybe this is not just an eye underneath this statue, maybe it's a person or maybe it's Jesus himself because why would it be only an eye who and how is it a living eye ALONE?! there might be other living organs under the surface, that's why they should make an X ray or something! If you look at the left eye, you'd find it also looks living but closed and even the lips! maybe it's a message or it's something to give the world or the american the strength because maybe there will be another terrorist's attack, specially after the last threat of the terrorists, maybe there gonna be something really sad and people dying that even broke the heart of Jesus and because he loves us, he is like saying "i am with you". maybe someone who thinks this is funny and did something to the statue and put an eye there at night, specially that there's a white around the eye. BUT THIS IS NOT TRUE AS THEY DID RESEARCHES AND FOUND IT A LIVING EYE. Jesus is not blonde but as he maybe has brown hair, maybe his eyes are blue! big deal! it maybe scary but not "creepy"! That's Jesus for Christ's sake!! !